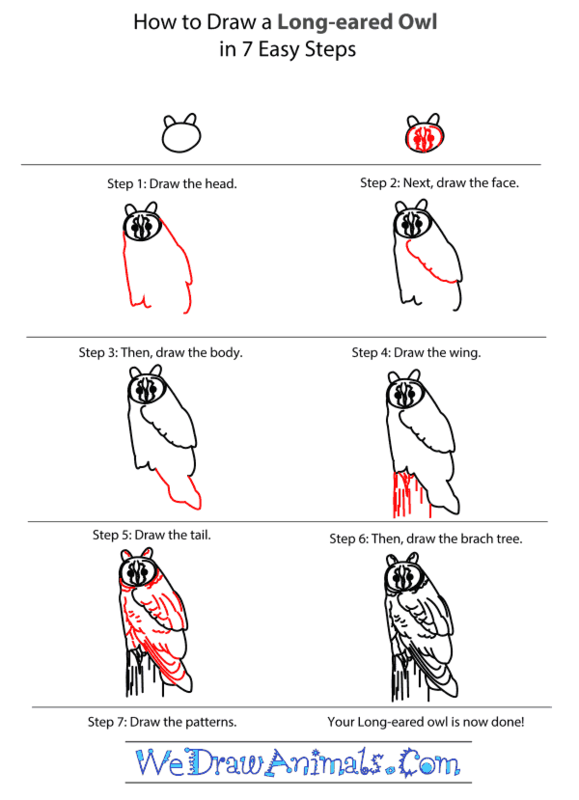 In this quick tutorial you'll learn how to draw a Long Eared Owl in 7 easy steps - great for kids and novice artists. 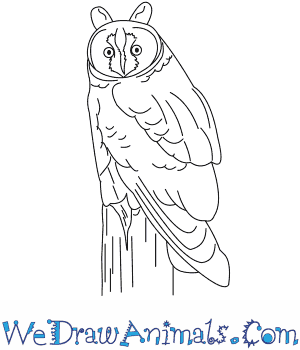 At the bottom you can read some interesting facts about the Long Eared Owl. 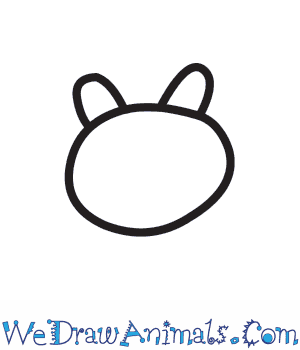 Step 1: Draw a circle with a small curve on the top right and left sides. 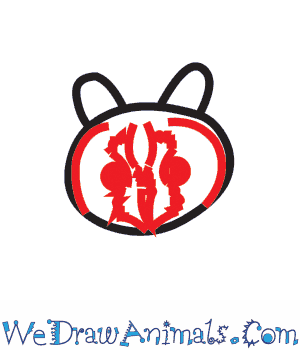 Step 2: In the middle of the head, draw two dots with an M-shape above them and a W-shape below; the midpoints of the M and W should meet each other. Draw curves along each side of the face. Step 3: Draw a line that goes down, bends up and inwards, then back down from the bottom of each side of the head. 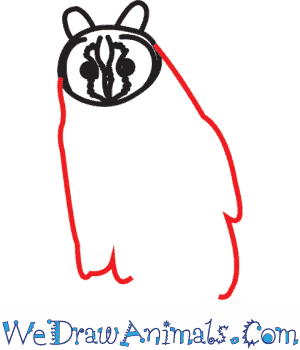 Step 4: Draw one wavy line that curves up from the midpoint of one side of the body to the head. Step 5: Connect the ends of the body with a curvy W-shape. 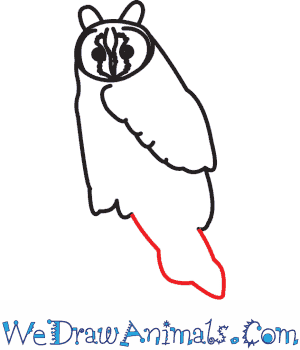 Step 6: Draw two long lines with several little wavy lines between them underneath the body so the owl has a log to sit on. Step 7: Draw curving line patterns all over the body. Done! You can color it light brown with darker brown markings. 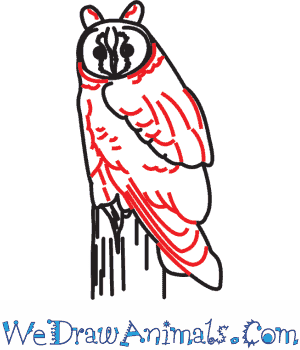 Long-eared owls will roost communally during the winter. The babies make a call that sounds like a rusty hinge moving. 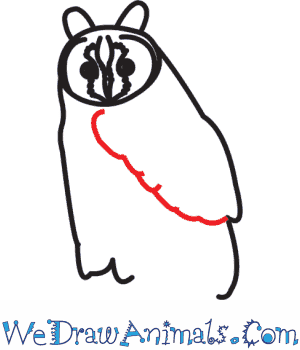 The Long-Eared Owl is a member of the bird group and the scientific term for them is Asio otus. As the name suggests, there are tufts of black feathers that point upward on the animal’s head, appearing like ears. The extra height is intimidating to other animals. This species lives in Europe, Asia, and North America. The body is brown with black stripes, the face is orange, and the feet are covered with feathers. They were depicted in a watercolor painting at London in 1827. These creatures weigh about 1 pound. They are almost 1.5 feet long. The wingspan is over 3 feet wide. The female is larger, but they are both nocturnal. In the daytime they perch on trees sometimes in groups. Nesting sights occur on the edge of forests, where a field is visible to the birds, so that prey is easily seen. 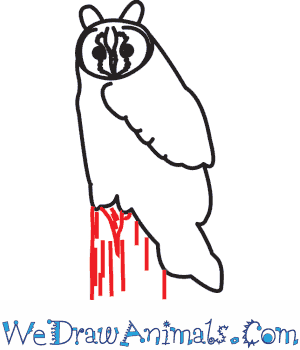 The nests are stolen from other birds, and the previous owner may be eaten. This species migrates during the winter, but not very far. These animals have a low population amount, but are considered to be the least concern for the possibility of extinction.